You can delete a subtenant account at any time, for example, if the subtenant no longer uses resources of the cloud repository. When you delete a tenant account, Veeam Backup & Replication disables this account and removes it. The subtenant account is removed permanently. You cannot undo this operation. 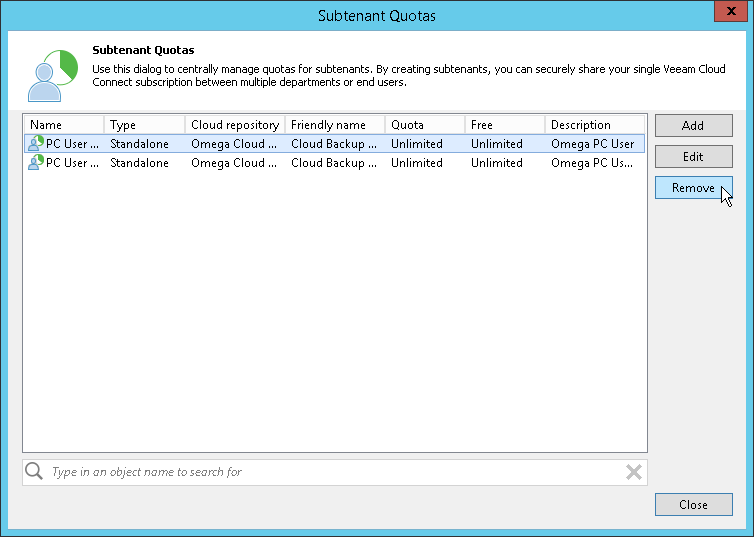 Subtenant’s backup data remain intact on the cloud repository. You can delete subtenant backup data manually later if needed. Open the Backup Infrastructure view, click the Backup Repositories node in the inventory pane, select the cloud repository in the working area and click Manage Subtenants on the ribbon. Open the Backup Infrastructure view, click the Backup Repositories node in the inventory pane, right-click the cloud repository in the working area and select Manage subtenants. Open the Backup Infrastructure view. Click the Service Providers node in the inventory pane, select the service provider in the working area and click Manage Subtenants on the ribbon. Open the Backup Infrastructure view, click the Service Providers node in the inventory pane, right-click the service provider in the working area and select Manage subtenants. In the Subtenant Quotas window, select the necessary subtenant account and click Remove. Enter the user name of the subtenant account or a part of it in the search field. Click the Start search button on the left or press [ENTER].